I have been working on perfect paella for about a year. Unfortunately something always went wrong. My paella would be too mushy, too crunchy, too salty or completely bland. After a year of testing the dish, I finally got it right, and found the perfect combination of ingredients. 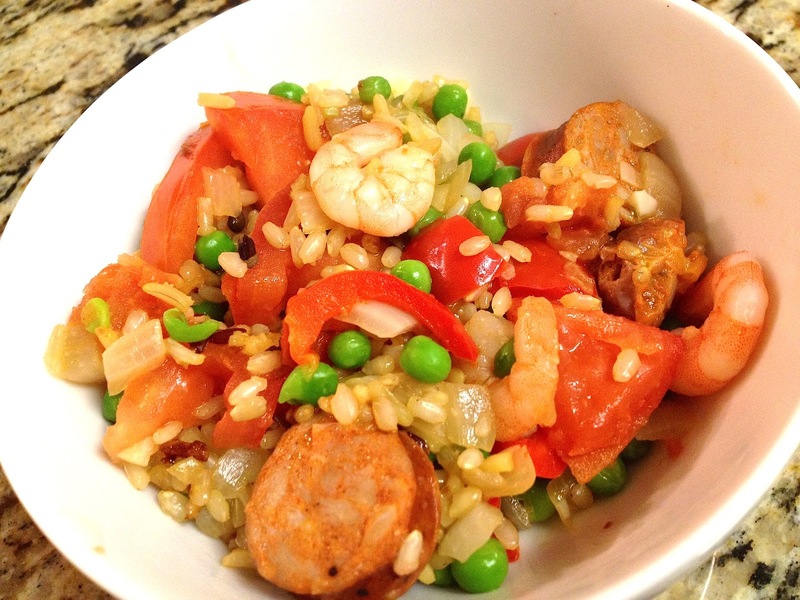 I love the taste of shrimp and spicy sausage with vegetables and rice. Although following the recipe below gives the most delicious results, when I am feeling lazy I throw the rice, saffron, paprika, bay leaves, and broth in a rice cooker. Next, I soften the vegetables on the stove, thrown in the sausage, and add the shrimp for just a few minutes. When the rice is cooked, I mix the cooked rice, vegetables, sausage and shrimp together. When I am pressed for time, this rice cooker version satisfies my paella craving. Preheat oven to 400°F. Heat oil in a large dutch oven over high heat. Add onion, red bell pepper, and garlic. Cook, stirring occasionally, until vegetables are tender, about 3 minutes. Add the cooked chorizo and cook until browned and fragrant, about 1 minute. Add rice, paprika, saffron, and bay leaves. Stir to combine and coat the rice, about 1 minute. Add chicken stock and bring to a boil. Add frozen peas, tomato and shrimp. Stir to combine. Transfer skillet to oven. Cook uncovered until rice is tender and no liquid remains, about 25-30 minutes. Remove from the oven. Fluff with a fork, season to taste and serve immediately.